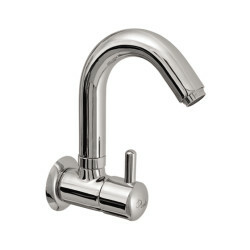 Kitchen taps are not just an aesthetic addition to the kitchen. They provide easy access to water and add utility to the wet-area in the kitchen based on how you use the kitchen. 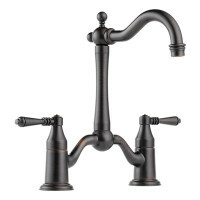 With many contemporary kitchen designs, there is a high demand for exclusive kitchen faucets for Indian homes. 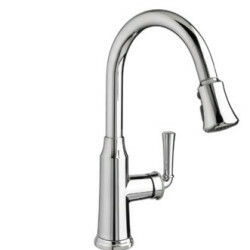 While choosing a kitchen tap, you also have to evaluate the type of kitchen sink, degree of water flow, use of the sink and check if the faucet is fitted for freshwater or hard water. 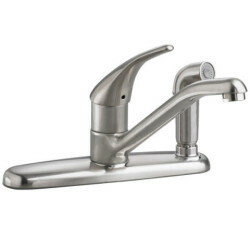 A few other aspects that are considered while choosing a kitchen faucet would be the amount of water you intend to save, preferred variation in water temperature, handle adjustment and so on. As mentioned earlier, the choice of a kitchen tap largely depends on the type of sink you choose. If you already have a kitchen sink for which you intend to replace the tap, then consider the number of tap holes the sink provides, the colour of the sink and the utility of the sink. If you are installing a new kitchen sink, even then the utility of the kitchen sink has to be considered. Single handle taps are the best option when you have to optimize on space. They come with a single lever that can be moved to left and right to adjust the flow of water. They come with durable ceramic disc valves. These come with swivel adjustment spouts. These are extremely convenient in small kitchen spaces and of great utility for small kitchen sinks. 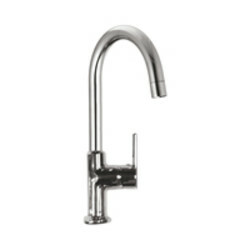 Monobloc kitchen mixers come with a single spout but with two faucets to control the flow of water. This allows you to add different water connections. It also allows you to manage between hot and cold water. 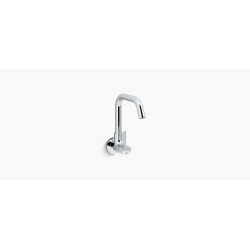 This monobloc kitchen tap comes with ceramic disc valves which provide a lifetime of smooth handle operation and drip-free performance. 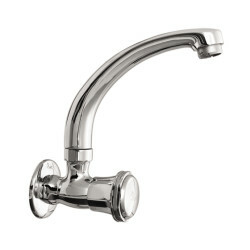 Choose durable brass construction for long life of the kitchen tap. 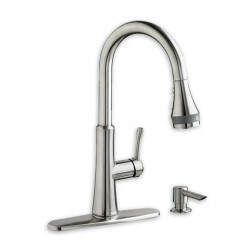 These are also referred to as Manual mixers.Some models come with spring-adjustable spouts that allows flexibility in drawing water. 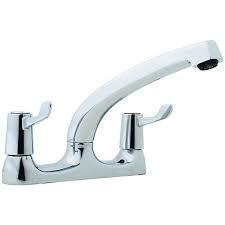 They can also be fixed to the wall while retaining the water flow into the sink. These are a sophisticated option that come with mixer features and also fulfills an aesthetic element. Pullout mixers give a good spray treatment to the flow of water. They come with touch sensor options and mostly with a single spout. Those with the manual feature come with a faucet on the side or the top. 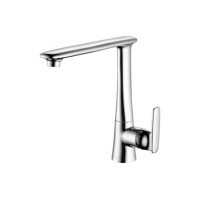 They come with more than two faucets since its unique feature is to allow water of different temperature to flow at the same time. 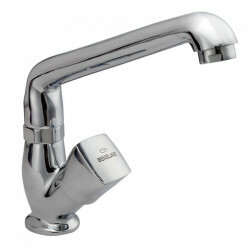 A variation of mixer taps are known as Bridge mixers, where the spout is raised above the surface giving a bridge effect. Kitchen fittings differ in their way of fixing. 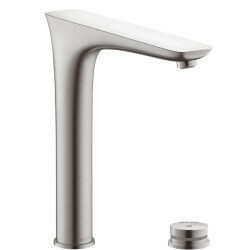 Models that can be installed on the sink as well as wall-mountable versions are available. Which installation type is the most suitable for your needs depends on the specific structural conditions around the sink. You will find suitable kitchen fitting models at Wishkarma for every application. Once you decide on whether you require a single-lever kitchen mixer or a two-lever mixer, stand-alone version or wall mounted, the next step is to decide on the specific features. Features vary from pull-out or swing-out spout, flexible pull-out sprayer, built-in shut-off valve or flush valve, low pressure capability and many more. Models with a built-in spare button or flow limiter reduce water consumption and is more environmentally friendly. Same is achieved with a specially optimized air bubblers, which enriches the water with air. Temperature limiters prevent scalding and increase safety. Almost all leading manufacturers carry these features in the products they carry and are continuously researching features that will be brought out in the years to come. 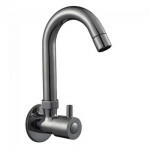 Kitchen taps are no longer mechanical fittings in the kitchen. They come with technological innovation for further ease of use. 1. 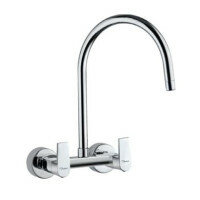 Kitchen tap units come with electronic, non-contact control - for example with an integrated infrared sensor which ensures that your kitchen mixer can be controlled without touching it. Water flow can be managed simply by hand movements. 2. 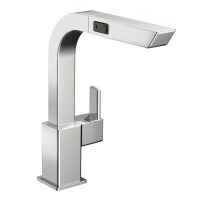 There are also models with LED illuminated water flow. This is not only for aesthetic use but also used as indicators for temperature control. 3. Foot control for the flow of water. If your work involves use of standing posture, then this feature is most preferred. 4. 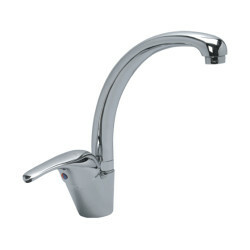 Kitchen faucet models also come with the option of being operated by battery power. In this case you may also want to have a backup of using the mechanical faucet when the battery gets completely discharged. 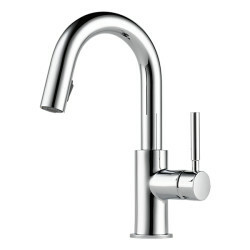 A high quality water tap is an important part of a beautiful kitchen. 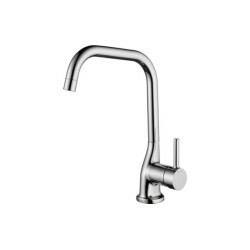 A modern kitchen tap could be much more than just a reliable water dispenser on the sink. 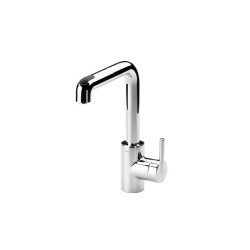 Leading manufacturers such as Vitra, Delta, Jaquar and Kohler to name a few, carry a huge selection of kitchen sink mixers with eye catching designs of high quality making. Kitchen sinks - There are different materials with which the sinks can be manufactured such as stainless steel (SS), granite or tile in some cases. Choosing a kitchen tap definitely depends on how many holes a sink consists so that it fits the tap and size of sink too needs to be taken into consideration. 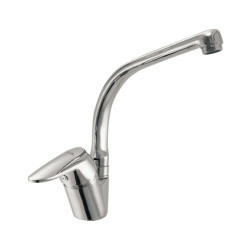 Kitchen Tap Handles - Handles come with swivel arms, pull-outs or hand sprays. These are to suffice the ergonomic needs. They are also yet times accompanied by water purification filters. 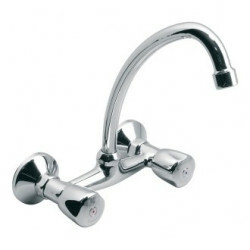 Spouts are an integral part of the handle which either come with a swivel or are stationed to the tap unit. Valves - Valves control the pressure and flow of water. For high durability, ceramic disc valves are the best option. 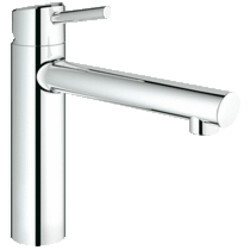 Brass compression valves are used in pillar and monobloc taps. Finishes - This not only adds beauty to your kitchen but is an important determinant in case of deciding between use for hard vs soft water. The finish depends upon the utility of the kitchen sink - washing vs drinking water outlets. Temperature of the water used, is another determinant. 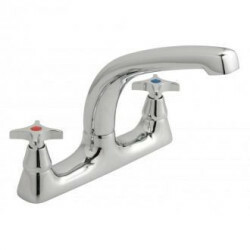 Kitchen taps come with a stainless steel effect, brushed finish, chrome-plated finish, glossy finish, high-gloss, satin, and antique brass, gold-plating; and powder-coated decorator colors such as white, black, red, and gray. Fittings & Technology - Is there a need for touch sensors. This is opted when you cannot monitor the amount of water being used. It adds value in saving water. LED lighting is another feature you need to decide upon. Touch-sensitivity is a great feature for Indian kitchens as the cooking procedures involve kneading flour and mixing with the hand which would make it a clumsy affair if you have to use a manual faucet. These features also make a great difference in design in terms of functionality, ergonomics, environmental efficiency. As brass has higher resistance to corrosion with soft water and calcification to hard water, they can be the best choice for a kitchen tap. They can be further gold-plated or powder-coated with enamel to bring a varied finish. Advantage: Brass taps are heavy & durable. There is a very low chance of corrosion of metal in hard water areas. Dis- Advantage: They cost more when compared to all other materials. Though these are brass taps, their cost is comparatively less with solid brass taps. The inner coated metal is die-cast zinc alloy that corrodes when the upper layer fades away. This causes health hazards when used with the chrome plated layer taken off. Taps with zinc alloy last for a long time. But when the electroplated finish is washed off, corrosion starts occurring which is also health hazardous. Advantage: Less expensive than solid brass taps, fairly durable. Dis- Advantage: The finish will wear off easily and will corrode affecting the health. Although a cheapest option among all, they are not recommended due to their less durability. 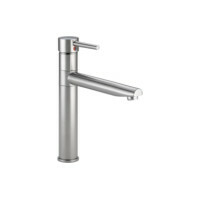 They are offered in metallic finish but don't exhibit a modern look and contradict the features applicable for customization unlike the taps manufactured in several designs to add the features like pull out, swivel spout when necessary. Advantage: Cheapest option of kitchen taps. Dis- Advantage: No durability, easy break down. 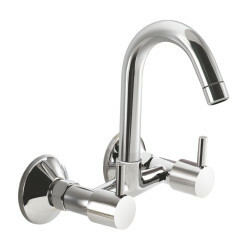 Kitchen taps could be wall-mounted or mounted on the counter-top. 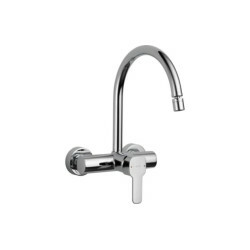 Here is a step-by-step guide with necessary precautions to mount a tap in the kitchen. 1. Before installation, ensure that all valves that connect to the sink are turned off. 2. Have the plumbing configuration handy before disassembling the existing connection or take a picture of the same. 3. As soon as you disengage, the water existing in the pipes may flow out. Hence, secure a bucket under the pipe to drain out the water. 4. Remove the faucet and clean the grime or sealant from the sink's surface. 5. Use the drywall saw to cut into the wall from the floor. Use the pipe cutter or a hacksaw to cut and remove the hot and cold supply lines. 6. For a sink, place the rubber or plastic gasket, or trim ring, over the faucet holes in the sink and set the deck plate. Refer to the manufacturer's instructions with regard to the use of caulk or plumber's putty in gasket installation. 7. Feed faucet lines into the holes. 8. Install washers and nuts underneath the sink. For a wall-mounted faucet, take the pieces apart using the soldering paste, and using the portable soldering torch, solder all the pipes, elbows and T-fittings together. Attach the completed pipe sections to the support blocks using copper strapping and galvanized screws. 9. Connect the water supply lines. 10. Turn on the water and check for leakages. 11. In case of the wall, paint the wall before fixing the lines. 12. 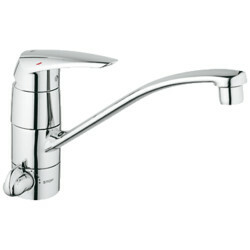 Remove the aerator from the faucet and let the water flow for some time. After that, place the aerator back into the faucet and you are ready! 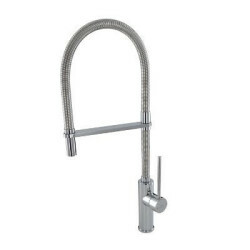 We provide kitchen taps, faucets, sinks and other kitchen fittings from branded manufacturers, to ensure that the quality is right. To name a few from our catalogue such as Hansgrohe, Grohe and Queo which are recommended. 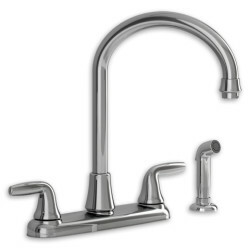 Which kitchen mixer should be used with instantaneous water heater? As a rule, you can use a normal kitchen mixer, that is a high-pressure mixer for a flow heater. However, there are also open small-flow heaters, which must be operated with a low-pressure fitting. If you are in doubt, you should contact the manufacturer of your water heater. Kitchen fittings with touch function or with a sensor are becoming more and more popular. 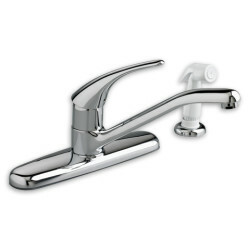 Both systems have the advantage that the faucet does not have to be handled with dirty fingers. 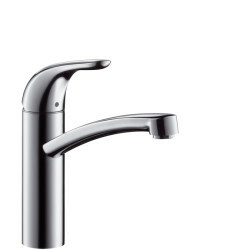 While sensor-controlled fittings work in a non-contact manner, the water has to be touched with a touch. But this can also be the elbow or the back of the hand. Just a body part that is not soiled. If you would like to operate a dishwasher or a washing machine in the kitchen, a kitchen faucet with a device connection or a shut-off valve is the right choice. These fittings have an additional connection for cold water below the sink. The shut-off valve is installed at the top of the valve. With it the water supply can be interrupted immediately, in order to avoid water damage.